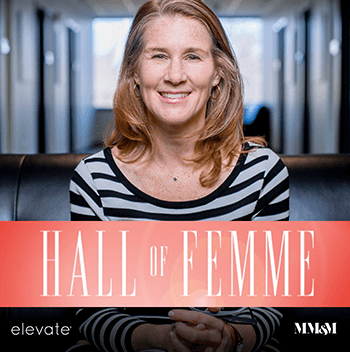 MM&M has announced the selections for the prestigious Hall of Femme, and Lorna Weir, Founding Partner of Elevate, was among just 16 senior leaders chosen for the honor. The MM&M Hall of Femme honors 16 of the most-senior female leaders throughout the biopharma, medical device, diagnostic, and agency sectors of the healthcare industry who have made a significant impact in marketing and communications. Weir was chosen based on her illustrious career in pharmaceutical marketing leadership, for the role she plays today in disrupting traditional agency models by founding her own innovative agency, and for helping to further the causes of women in the industry. Lorna started Elevate based on a vision of serving clients’ strategic, business and commercial aspirations on a higher level than just tactical execution—being dedicated, tireless, tenacious advocates for achieving clients’ goals. The Hall of Femme honor comes after a career path that has taken her from Wall Street to law (Weir holds a JD), from business-to-business and consumer marketer to healthcare specialist. Weir is former president of successful healthcare agencies, and has nearly 20 years of experience in healthcare marketing and communications, spanning pharmaceutical, medical devices, and diagnostics across a number of therapeutic areas, including oncology, hematology, medical devices and diagnostics, central nervous system, nephrology, rheumatoid arthritis and osteoarthritis, cardiovascular, and obstetrics and gynecology. The Hall of Femme inductees will gather June 8, 2017 for discussions that will cover everything from initiatives that incentivize women’s leadership to policies that lay the foundation in our industry for generations of women to come. Meet the 2017 Femmes, hear their first-person narratives behind their achievements, and access content and networking that explores the issues most relevant to female leaders working in healthcare marketing today. For more information, visit MM&M and check out the Hall of Femme feature.